'The Not So' - I grew up as a Son of a Sailor with a wandering mind. Listening to the US Navy sailors and others tell stories of where they were from or life experiences filled my days and my imagination growing up. Often at night, I would listen to my Dad read tales of adventure and history aloud as I drifted off to sleep; thus, began my love of stories and story-telling. I still like to listen to people’s stories and share a few of my own. I still have a passion for books, and I still have my wanderer’s spirit! As a non-native Arizonian, I have been fascinated with the history of the Grand Canyon/Valentine State. 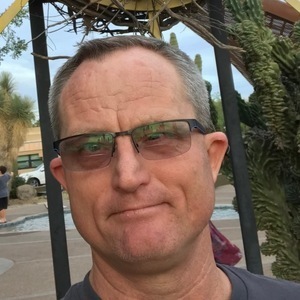 I moved to Arizona in 1992 (not so native) and have been wandering around learning and listening to stories of the past and present. I have shared them with my wife and two kids. Now, using their own words, I want to share these stories with you. 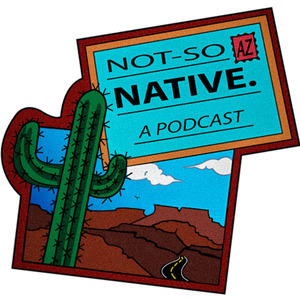 I hope you enjoy this podcast and once you hear the stories of Arizona and the people who make it an awesome place to live, you will also want to get out and explore! Robert Lamb has hosted 15 Episodes. Season 2 took us through different towns, highways, elevations both above and below ground, climates, but most of all it allowed us to share of stories of different people and places from Arizona. Join us on the patio of Reds Bar & Grill and The Wigwam resort as we discuss our favorite moments from our second season. We sit down for a conversation with living legend and 'Rockstar of Seligman' Angel Delgadillo. Angel has been dubbed 'The Angel of Route 66' as he took it upon himself to save and resurrect the Historic Route 66. This is his story. Looking for somewhere that you could arrive in your private plane, stay in an RV one night, a motel the next, enjoy some great food, visit some dinosaurs, have a beer in a prehistoric cave, some more good food and delicious giant pies, hunt some ghosts, then finish off the last night sleeping in one of the worlds most unique hotel rooms 220 feet under the ground? Well at the Grand Canyon Caverns you've found just that. Rob and Stephanie finished their Williams vacation with a visit to Pat George from the Grand Canyon Deer Farm. Rob and Stephanie sit down with John Moore proprietor of Wild West Junction and Mayor of Williams, Arizona. Large brim cowboy hats are not the only hats John wears. Currently Mayor of Williams he previously served as Police Chief and entertainer to the good people of Williams, Arizona. Rob and Stephanie visit the Canyon Motel & RV Park in beautiful Williams, Arizona. Located by the historic route 66 we spend time with owner Shirley Young to discuss this Arizona gem. Part 2 of our Bearizona special Dave takes Rob and Stephanie on a stroll through Fort Bearizona. In addition to the drive through portion of the park you heard about last week Bearizona has a separate walk-through area full of wildlife. We take a guided tour through Bearizona in Williams along with Dave O'Connell from the park. If you time it right you can start the episode when you enter the park and allow Dave to narrate your journey. In this episode Rob shares an article about how Arizona became the Valentine state. The story originally written by Jana Bommersbach appeared in the Arizona Republic February 13th, 2012. We spend the time sharing what motivated us to start the podcast and what we’ve learned throughout this inaugural season. In this episode we sit down with Laura Hansen of Saddle Mountain Brewing Company. Laura shares the story of what led her and her husband Jacob to open the restaurant and brewery in the Phoenix West Valley city of Goodyear. We walk through the Litchfield Park Museum as Judy Cook of the Litchfield Park Historical Society guides and narrates through the museums exhibits. We sit down with Social Media and Marketing Manger Sarah Boyd for a conversation in the 100 year old Organization House at the beautiful 4-Star Wigwam Resort located in heart of Litchfield Park, Arizona. We sit down with fellow native Ryan Whitten in the tasting room of his microbrewery 8-Bit Aleworks. If you like video games and beer, you'll enjoy this one.